A quick lunch with leftover meatballs. The melted cheese, herbs and spices with the addition of olives makes this one over the top delicious in flavor. Toast the top brushed with olive oil and garlic to add that crispy topping! 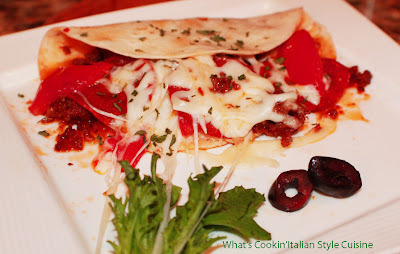 Italian Style tortilla gone wild! Crush meatballs in a bowl and set aside. Take a flour tortilla and brush with olive oil on both side. Fill top layer with crushed meatball, adding the mozzarella on top then sliced tomatoes, roasted peppers and olives and anything else you like to add. See below. Fold over in half. Brush with olive oil again adding the minced garlic to the top. Sprinkle with grating cheese, oregano,parsley and drizzle with a little olive oil. Bake on a foil lined cookie sheet until brown and crisp shell around 20 minutes on 400 degree hot oven. You can top with more sauce and shredded cheese for garnish. Suggestions for additions: portabello mushrooms, roasted eggplant, cooked zucchini, chopped canned artichokes or chopped spinach. This makes my stomach growl! Delish! My kind of lunch. Yum! !